Over 60 lbs of apples (about 25 kilos) go into each bottle. Notes:The apples are grown on their own farm in a sustainable manner, harvested, hand-inspected, mashed (made into apple cider and fermented) all on site. A strict historical interpretation suggests that the term applejack for this product is a misnomer. 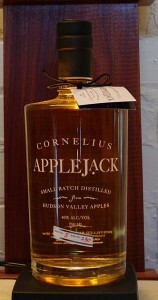 Applejack was produced by congelation (freezing hard cider in a buried cask, digging it up and removing the alcoholic liquid core) – not distillation, however, very few people use this method anymore. * Harvest Spirits distill the resulting hard cider in small hybrid copper pot/column stills rather than the industry standard column stills – which are huge affairs that produce industrial grades and quantities of spirits for the mass market. Appearance: Lovely bright appearance, slight tan gold color to it. First Impression: Alcohol, apples, vanilla, oak, hints of nutmeg. . . green apples. Taste: Apple, allspice, vanilla, lingering oak char finish. Drinks: Good for recipes calling for applejack and for cooking. There are a number of recipes available from the web site, if you write to them they will send you some better ones that also are more detailed. Cigars: Works well with a pipe instead. Bottle: The bottle is bright clear glass which shows off the color to good effect.The label is silk screened directly onto the glass. Small paper label designates batch and bottle number so you can look up the distillers notes on the website. Black neck wrap with a pseudo paper signature seal completes the package. Final Thoughts: Nicely done, subtle and complex. Infinitely better than much of the competition. Fast loading, nicely done, website. One of the more informative websites from a microdistiller. Be sure to read the distillers notes on the batch you are drinking (and of course the other ones too). Nice to know how your spirits were raised. * It is also not recommended as the freezing method while it freezes out the water leaves the alcohol and a lot of poisonous byproducts in liquid form with no easy way to separate them from each other- a rather toxic cocktail.